The Chaffee administration has said it ought to pay back the debt, but maybe the cost of not doing so is worth it. 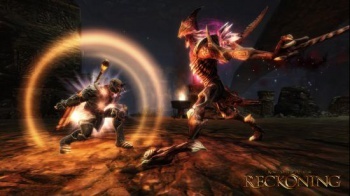 38 Studios, of Kingdoms of Amalur: Reckoning fame, went out leaving a massive hole in the finances of home state Rhode Island, which Governor Lincoln Chafee has pledged to repay. It's not a legal obligation, his administration insists, but a moral one. Morals cost money, Chafee has discovered, and now his people are wondering just how awful the consequences would be if Rhode Island bailed on 38 Studios debt. It's all about options, spokeswoman Christine Hunsinger said, and even if Chafee's position hasn't yet changed that "doesn't mean you don't analyze what the situation is, or gather data to understand the ramifications of what that decision would be." Currently the state is looking at paying back something in the region of $112.6 million over ten years. Although the state has filed a lawsuit to recoup some of its losses, the likelihood of financing a significant portion of that debt using those means may not appeal as much to Chafee now as it did back in November 2012. Before the lawsuit, Governor Chafee described the 38 Studios debacle as "an economic development crisis for the state of Rhode Island." It looks as though that crisis may be too much for Chafee to deal with, without compromising his moral position on debt.